Get closer to reality with the Logitech Pro Flight Quadrant, upgrade your simulation experience with the precise control on offer. 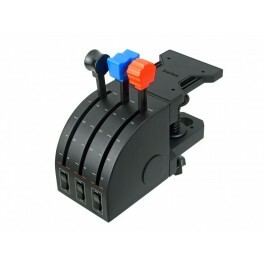 Whilst the unit works perfectly on its own, it is an ideal companion for the Pro Flight Yoke. Set the levers to control aircraft throttles, adjust elevator trim, fuel mixture or even to engage reverse thrust during landing.